BACKGROUND AND PURPOSE: Synovial sarcomas are soft-tissue tumors that rarely occur in the head and neck. The purpose of this study was to evaluate their CT and MR imaging appearance and to show that they may have a surprisingly benign imaging appearance. METHODS: Eight patients with histologically proved synovial sarcoma underwent CT ; additionally, MR imaging examinations were performed in five of the eight cases. Attenuation and signal intensity on CT scans and MR images, respectively, were studied by two radiologists. They analyzed the location, size, margins, homogeneity, presence of adenopathies and infiltrative signs, and enhancement after injection of contrast medium. RESULTS: Four tumors were located in the hypopharynx, two arose from the infratemporal fossa, one arose from the maxillary sinus, and one arose from the faucial tonsil. Tumor sizes ranged from 27 to 70 mm. On CT scans and MR images, six lesions were homogeneous and well defined, with smooth margins. The remaining tumors were heterogeneous. In two cases, adjacent tissues were invaded. Calcifications were observed in one case and adenopathy in two cases. In three cases, the lesions were isointense on T1-weighted MR images and hypointense on T2-weighted MR images, and in the other two cases in which MR imaging was performed, the lesions were both isointense and hypointense on both T1- and T2-weighted images. Only the two local recurrent lesions were multilocular. CONCLUSION: Synovial sarcomas are aggressive sarcomas that may appear “benign” in some cases. In a young man, a synovial sarcoma may be suspected when a well-demarcated, homogeneous lesion is found in the head and neck. Synovial sarcomas are malignant soft-tissue tumors primarily affecting the extremities in the young adult male. Synovial sarcomas account for 7% to 10% of all sarcomas (1–4), and only 3% arise in the head and neck region (5). Other rare sites are the chest, the lower back, and the abdominal wall (3). The first case of head and neck synovial sarcoma was described in 1954; it was located in the pharynx (6). Synovial sarcoma of the head and neck region seems to carry a better prognosis than synovial sarcoma of the extremities, with 5-year survival rates ranging from 47% to 82% (7, 8). The CT and MR imaging appearance of synovial sarcomas of the head and the neck has been described in previous publications as most often well limited with sometimes a cystic or hemorrhagic component and calcifications (3, 4). These lesions were often found to be isointense in relation to gray matter on T1-weighted MR images, and the signal intensity is similar to that of fatty or glandular tissue on T2-weighted MR images (3). For other authors, synovial sarcomas exhibit an intermediate signal intensity on T1-weighted images and a heterogeneous hyperintense signal on T2-weighted images (4). No pathognomonic features of these lesions have been described. It would be helpful if imaging features were sufficiently informative to contribute to the diagnosis. This study describes the CT and MR imaging features of eight cases. Between 1984 and 1997, eight patients were evaluated for head and neck synovial sarcomas. All patients underwent CT. CT was performed with various conventional CT scanners (n = 4) or with helical scanners (n = 4). For conventional CT, incremental scans were obtained with 5-mm contiguous axial sections after manual injection of 100 mL of various ionic contrast media administered at a rate of 2 mL/s. Helical CT was performed on a HiSpeed Advantage scanner (General Electric Systems, Milwaukee, WI) in the axial plane, with 3- mm collimation and a 1.5 pitch, after a bolus injection of 50 mL and then a perfusion of 100 mL of non ionic iodine contrast medium (Xenetix, Guerbet, France). Five patients underwent MR imaging with a 1.5-T system (Signa, General Electric Medical Systems), in axial and coronal planes, with T1-weighted (600/20 [TR/TE]) and T2-weighted (2000/20–90) spin-echo sequences, first without and then with injection of gadolinium (Dotarem, Guerbet, France). The CT and MR imaging studies were reviewed by two radiologists whose findings were based on consensus. We analyzed the location, size, homogeneity, and margins of the lesion on both CT scans and MR images. On CT scans, we analyzed lesion attenuation in relation to head and neck muscles, the presence of intralesional calcifications, and adenopathies. Aggressive and invading signs, such as fat infiltration and bone demineralization, were also analyzed. The hyoid bone, thyroid, cricoid, and arytenoid cartilages were analyzed in bone algorithms. All CT scans were obtained in soft-tissue and bone algorithms and filmed in the respective window settings. The signal intensity of the lesion in relation to muscles was studied on T1- and T2-weighted MR images. Fat infiltration was assessed on T1-weighted images. Lesion enhancement was evaluated after injection of contrast medium on both CT scans and MR images. Radiography of the chest was performed in all cases. In all cases, the diagnosis of synovial sarcoma was histologically confirmed. CT was performed in all cases at the time of diagnosis. CT was performed from 1 to 6 months after treatment of the tumor and every year thereafter in six cases. MR imaging was performed in three cases at initial staging, in addition to CT. MR imaging was used for follow-up examinations in four cases (two cases only for recurrences). The two recurrent lesions were diagnosed by CT and MR imaging. There were six men and two women; six ranged in age from 17 to 21 years (75%) and two were 61 and 68 years old. 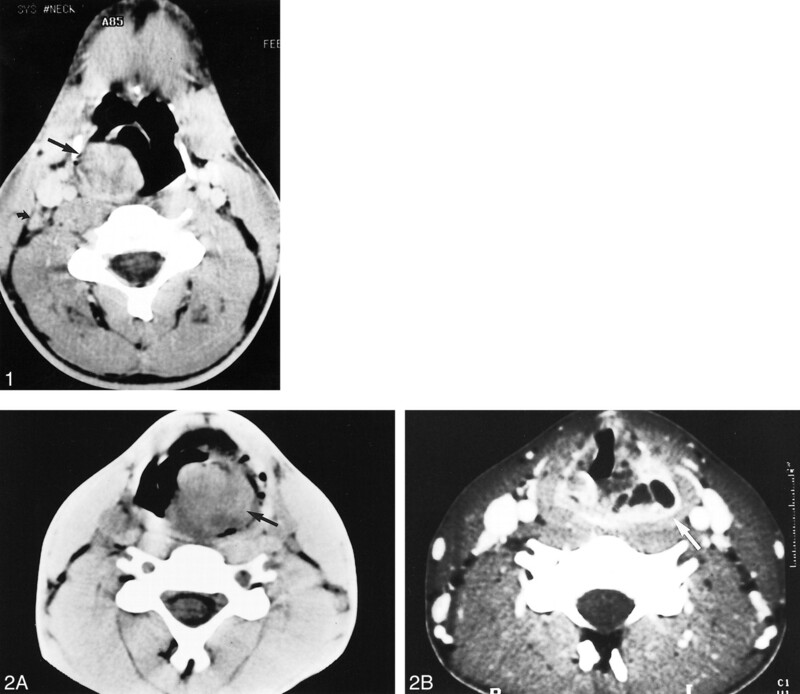 Four tumors were located in the hypopharynx (50%) (cases 1, 2, 3, and 6). 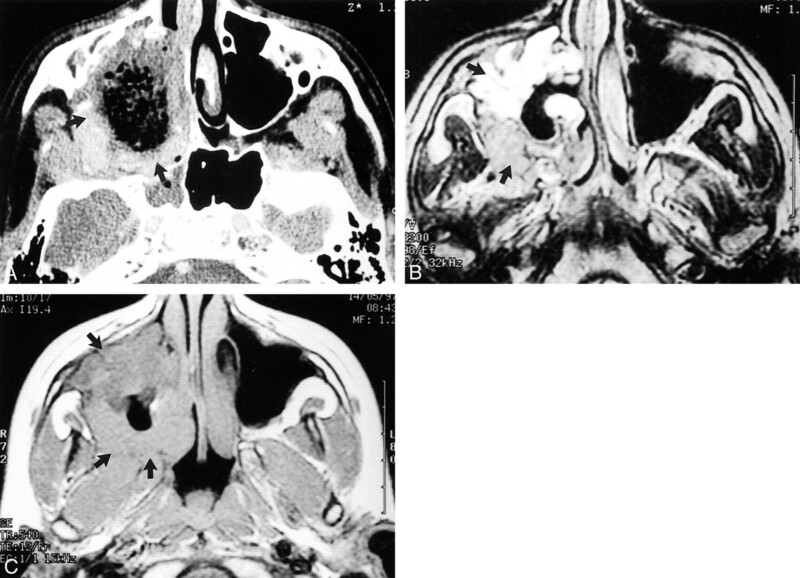 Two tumors had arisen from the infratemporal fossa (cases 4 and 7), one from the right maxillary sinus (case 5), and one from the left faucial tonsil (case 8). On CT scans, the size of the greatest diameter of the lesions varied from 27 to 70 mm (mean lesion size, 42 mm). Four lesions measured < 35 mm. In six cases, tumors were well demarcated and homogeneous with smooth margins (Figs 1 and 2A). The two remaining tumors were heterogeneous, with infiltration of adjacent soft tissues (cases 1 and 2) (Fig 2B). Calcifications were found in only one case (Fig 3). All tumors exhibited homogeneous enhancement after injection of contrast medium. Axial view contrast-enhanced CT scan of a 21-year-old man who consulted for dysphagia associated with dyspnea that worsened when lying supine. A homogeneous, well-demarcated mass can be seen, seemingly arising from the right lateral wall of the oro- and hypopharynx (arrow), associated with a homolateral deep cervical node (curved arrowhead). No recurrence had occurred 5 years after surgery, chemotherapy, and radiotherapy. fig 2. Images from the case of a 17-year-old male patient who consulted for a painless progressively enlarging neck mass and complained of dyspnea. A, Initial non-contrast-enhanced axial view CT scan reveals a left hypopharyngeal mass involving the left piriform sinus (black arrow). Initial axial view contrast-enhanced CT scan of a 61-year-old woman who noted a slowly growing mass of the left external fossa that was associated with intermittent pain in the left temporomandibular joint. A tumor of the left infratemporal fossa, with intra-tumoral calcifications (arrowheads), can be seen. The lesion is invading the left temporal muscle and the left greater wing of the sphenoid bone (arrow). Histologically, it is a spindle cell monophasic synovial sarcoma. No recurrence had occurred 8 years after surgery and radiotherapy. fig 4. Images from the case of an 18-year-old female patient who presented with a synovial sarcoma arising from the right infratemporal fossa. A, Axial view T1-weighted MR image (600/20/2 [TR/TE/ excitations]) shows a voluminous, homogeneous mass involving the right lateral pterygoid and temporal muscles and displacing the posterior wall of the right maxillary sinus anteriorly. The lesion exhibits an isointense signal (arrow). Bone infiltration was present in two cases at the time of the diagnosis (cases 4 and 6). The greater wing of the sphenoid bone was invaded in two cases and was associated with invasion of the wall of the maxillary sinus in one case. 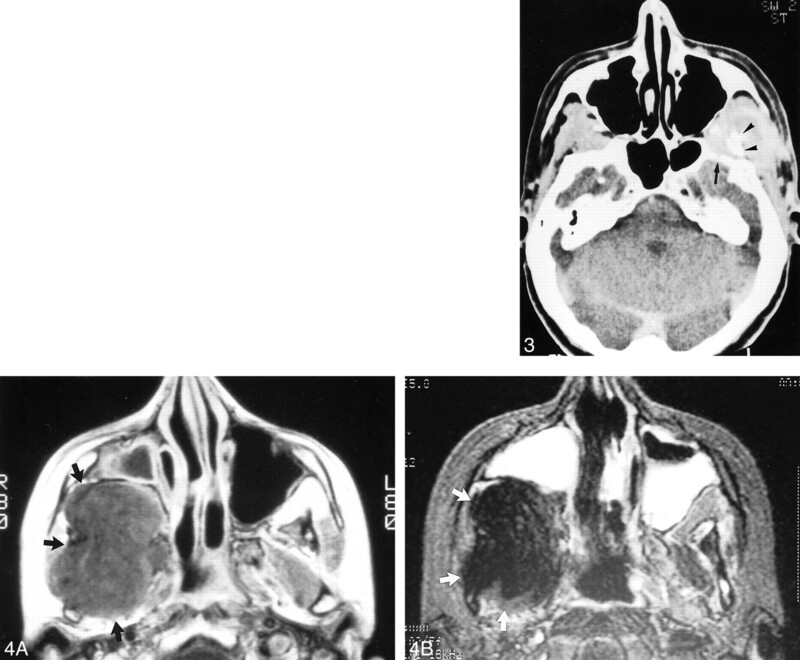 In one synovial sarcoma discovered 15 years before the current CT and MR imaging explorations (case 7), the posterior wall of the maxillary sinus was displaced anteriorly without signs of demineralization. Fat infiltration was present in one case at the time of the diagnosis (case 4). Three tumors were slightly hypointense on T2-weighted MR images and isointense to muscles on T1-weighted MR images. In one case, the lesion had been stable for 15 years and presented a strongly hypointense signal on T1- and T2-weighted sequences (Fig 4A and B). One lesion was isointense on T1- and on T2-weighted sequences. Only the two recurrent lesions were multilocular (cases 1 and 2). One lesion was heterogeneous with a necrotic center, where there had been infiltration of the bone, which appeared as a hypointense signal on T1-weighted images (case 6) (Fig 5C). Images from the case of a 12-year-old male patient who complained of dental pain associated with nasal obstruction and progressive exophthalmos. A, Initial contrast-enhanced CT scan shows a heterogeneous, necrotic mass involving the right maxillary sinus (arrows), invading the wall of the maxillary sinus, the right nasal fossa, and the right lateral pterygoid muscle. B, T2-weighted MR image (3695/99/2) shows that the lesion is heterogeneous. Synovial sarcomas were biphasic in four cases and monophasic in the four other cases. There was no difference in outcome between these two histologic types. MR imaging was performed in five patients; in only three of these patients was it performed before surgery, and these three patients had monophasic synovial sarcomas (cases 4, 6, and 7) (Fig 6). In these three cases, the lesions were hypointense on T2-weighted images and isointense on contrast-enhanced T1-weighted images, and one of them was necrotic and heterogeneous (case 6) (Fig 5). We were also able to compare the signal intensity of the two histologic types. Histologic analysis of spindle cell monophasic synovial sarcoma (case 4). A, Tumor cells are stained brown antibody anti-vimentin. Enlarged cervical nodes were found in two cases (cases 5 and 8), but there was no lymph node involvement at histologic analysis. No lung metastases were found. Seven patients underwent surgery and then radiotherapy. Seven patients received chemotherapy. In one case, surgery could not be performed because the tumor was inaccessible (infratemporal fossa), and the patient thus received only chemotherapy and radiotherapy (case 7). In this case, 15 years of imaging follow-up confirmed stability. In five cases, the outcome was favorable, with no recurrence during follow-up that ranged from 10 to 15 years (cases 3, 4, 5, 6, and 8) (Fig 7). Biphasic synovial sarcoma (case 8). A, Prominent keratin-immunoreactive epithelial cells can be seen among keratin-negative spindle cells. In two cases, recurrence occurred after partial surgery (cases 1 and 2). One of these two patients underwent a second surgical intervention, which was complete, and then received chemotherapy and radiotherapy and was in good health 2 years later. The other patient was awaiting additional surgery at the time of this writing. The lesion treated exclusively with chemotherapy and radiotherapy (case 7) remained unchanged after 15 years of imaging follow-up, with no signs of aggressiveness. Synovial sarcoma can occur at all ages but most frequently affects young adults and adolescents (3). Six of our patients were young men ranging in age from 12 to 21 years (75%). Two patients were older than 60 years. Synovial sarcomas account for 7% to 10% of all sarcomas (1, 3, 4, 9), and only 3% arise in the head and neck region (2). Many synovial formations are found in the neck: “Boyer's bursa mucosa,” the synovial membrane of the cricothyroid, cricoarytenoid joint, and temporomandibular joint (4). Boyer's bursa mucosa is the old term used to describe the retrohyoid bursa. This bursa is a space situated under the hyoid bone, between the thyrohyoid membrane and the thyrohyoid muscle. Synovial sarcomas are most frequently located near the joints but can also occur at any site (5). Although synovial sarcomas are often adjacent to joints, especially around the knees, they do not originate from synovial tissue (3, 4) but from pluripotential mesenchymal cells near or even remote from articular surfaces, tendons, tendon sheaths, juxta-articular membranes, and facial aponeuroses (3, 4, 10). The lesion arises from malignant degeneration of these primitive mesenchymal cells (11). Histologically, this tumor is composed of epithelial and spindle cells, exhibits a biphasic appearance, and reproduces features synonymous with normal synovial structures. However, synovial sarcoma can be composed of only one cell type, whereupon it is classified as monophasic spindle cell-type or monophasic epithelial cell-type synovial sarcoma (1, 2, 5, 10, 12). In our study, half the patients had monophasic spindle cell-type synovial sarcomas and the other half had biphasic tumors. Chromosomal rearrangements have been reported in association with synovial sarcoma of the head and neck and of sites other than the juxta-articular regions, the most common of which is a translocation between chromosomes X and 18 (11, 13). This translocation has not been found in other sarcomas or carcinomas and may be a key molecular event in the development of synovial sarcoma. Cytogenetic analysis may also be helpful for the diagnosis of synovial sarcoma showing this characteristic karyotype. Manifestations of synovial sarcoma vary according to the tumor site. In some cases, a cervical or parapharyngeal mass (causing pain in 40–60% of the cases) signals the presence of tumor (3). Dyspnea, hoarseness, or dysphagia may accompany tumors at laryngeal sites. Other locations in the head and neck have already been reported in the literature: the masticator space, parapharyngeal space, sinonasal space, and pharynx (1, 2, 14). The most common site affected in the head and neck is the hypopharynx (1). As mentioned above, these tumors arise from mesenchymal cells near or even remote from articular surfaces, tendons, juxta-articular membranes, and fascial aponeuroses. The hypopharynx may also be the most frequent site of head and neck synovial sarcoma because it is the seat of numerous synovial formations. Consistent with the literature, the hypopharynx was the most frequently encountered site in our cases, where the lesions appeared as expanding masses causing pain, dysphagia, and sometimes hemorrhage in the oral cavity. On imaging studies, synovial sarcomas are varied in size. The mean size of these masses, which incidentally has an impact on survival, ranges from 2 to 9 cm (3, 15). In our study, tumors ranged from 2.7 to 7 cm. Some authors claim that the size of the synovial sarcoma has an influence on the prognosis, which was found to be better in patients whose tumors were < 4 cm in diameter than in those with larger tumors (1). In our study, there was no relation between the size of the lesion and outcome, but it should be borne in mind that the lesions were not very large, with a mean size of 42 mm. CT classically displays a multilocular tumor with smooth margins and heterogeneous enhancement after injection of contrast medium (3). In our series, the majority of tumors before surgery were homogeneous and well defined, and only one lesion was heterogeneous. Multiloculation was not encountered in lesions before surgery but only in the recurrent lesions. CT allowed assessment of possible airway compression. Tumors may contain calcifications that tend to be associated with better survival (3, 9, 16). They are found in ≤ 30 % of all sites (2). In our study, calcifications were observed in one case. Hemorrhage and necrosis have been described but were not present in our cases (2). CT rarely detects lymph node involvement that occurs in 12.5% of the cases of head and neck synovial sarcoma (11). In our cases, two patients had enlarged cervical nodes but no lymph node involvement at histologic analysis. MR imaging revealed a tumor of intermediate intensity on T1-weighted sequences and of variable intensity on T2-weighted sequences, with heterogeneous enhancement after injection of contrast material (17, 18). In general, calcifications are hypointense on T1- and T2-weighted images but to a lesser degree than on CT scans. Areas of hemorrhage, fluid-fluid levels, and cyst formations are frequent (1, 5). In our cases, tumors were frequently isointense on T1-weighted MR images and of variable intensity (often iso- or hypointense) on T2-weighted MR images. The head and neck region is the site of multiple tumors, and squamous cell carcinoma is the most frequent among them. Squamous cell carcinoma is an infiltrative tumor, the margins of which are irregular, sometimes difficult to distinguish from adjacent soft tissues, and frequently associated with cervical node metastases (19). MR imaging classically displays an isointense signal to muscle on T1-weighted sequences and a moderately hyperintense signal on T2-weighted sequences, with enhancement after contrast medium injection (19). Squamous cell carcinoma is easily differentiated from synovial sarcomas, but other head and neck tumors may have imaging features that are similar to those exhibited by synovial sarcoma. Tumors that are difficult to distinguish are both benign and malignant tumors. Schwannomas, neurofibromas, and tumors of ectopic minor salivary glands are benign tumors that may appear homogeneous and well circumscribed. MR imaging displays an isointense signal to muscles on T1-weighted sequences and a signal of variable intensity on T2-weighted sequences (high intensity for benign tumors of ectopic minor salivary glands and intermediate or hyperintensity for the others, according to their cellularity) (3). Sarcomas of the head and neck are rare mesenchymal malignant tumors that account for 15 % of all sarcomas (20). Many histologic types exist: rhabdomyosarcomas, leiomyosarcomas, fibrosarcomas, and liposarcomas. Rhabdomyomas account for 35% to 40% of the soft-tissue sarcomas that occur in the head and neck (3). The other sarcomas arise less frequently in this region (3–19%). The differential diagnosis between synovial sarcomas and rhabdomyosarcomas and fibrosarcomas may be difficult. Between 1977 and 1981, Golding and Husband (21) analyzed CT findings in 77 patients with soft-tissue sarcomas. In this study, the majority of tumors appeared as masses that were well defined, either by surrounding soft-tissue planes or because the attenuation value of the tumor was a significantly different attenuation value from that of the surrounding tissues. No correlation was found between the CT characteristics and the histologic findings (21). Rhabdomyosarcomas and fibrosarcomas exhibit an intermediate signal intensity on T1- and T2-weighted images, whereas liposarcomas have a high signal intensity on T1-weighted images and an intermediate signal intensity on T2-weighted images (3). Non-Hodgkin's lymphoma is also part of the differential diagnosis, as it may present as extra-nodal lymphatic disease with a single focus or multiple foci (22, 23) and may sometimes be associated with nodal disease. Often, it cannot be distinguished from other benign or malignant head and neck tumors (22). The recommended treatment is a wide excision with negative margins, often including surrounding muscle groups or total amputation (19, 24). Postoperative radiotherapy is advocated in the head and neck to improve local control rates; adjuvant chemotherapy may prevent or delay the occurrence of distant metastases (14, 16, 18, 24, 25). Limited excision is followed by a high incidence of local recurrence (60–90%) within 2 years (10). This evolution was observed in two of our cases after partial surgery. In these two patients, the initial lesions appeared well demarcated with smooth margins, had no signs of local invasion, and had greatest diameters of 30 and 47 mm, respectively. Imaging revealed that recurrent lesions were very different from the initial primary tumors and presented as infiltrative, multilocular lesions. The size of the primary tumor, resection margins, and histologic type are the major prognostic factors for survival in the cases of synovial sarcoma described in the literature (3, 10, 26), and high objective response rates usually are obtained with neoadjuvant chemotherapy and postoperative radiotherapy (10). In conclusion, sarcomas, including synovial sarcomas, may appear well demarcated and homogeneous. Unless there is a characteristic feature of the benign lesion, tissue sampling and careful management are important. The authors thank Lorna Saint-Ange for editing. ↵1 Address reprint requests to Daniel Vanel, MD, Department of Radiology, Institut Gustave Roussy, F-94805 Villejuif Cedex, France.